Media technology—from mass media to social media and from video gaming to computer-mediated communication—plays an increasingly central role in people’s lives. Due to exponential increases in computing power, people now carry incredibly powerful computers—their smartphones—everywhere they go. This ever-greater access to media technology is generating an ever-greater conflict between media activities and the unmediated activities critical for psychological well-being—from our face-to-face conversations and family time to our down time and work lives. What are the costs and benefits of people’s modern media technology use for psychological well-being? Using a complementarity-interference (CI) framework, I review research to illuminate key psychological processes (i.e., mediators) and conditions (i.e., moderators) of the relationship between media technology and psychological well-being. Based on the existing evidence, I propose an initial theoretical CI model of the effects of media technology on psychological well-being. I use this CI model to outline important directions for future research, providing guidelines for an integrated, theoretically informed research on media technology. Imagine that you have a time machine that can transport you to the past for a day at a time. You set the year you want to travel to before you go to bed, and you wake up on the same calendar day but as far back in the past as you wanted to travel. You decide to use the machine go back to the time of cavemen. As you wake up in your cave, what options are available to you? You can stay in bed a little longer under the warm animal hide covers, walk around the cave inspecting the carvings, or perhaps take a walk and try to find some food (while presumably avoiding being eaten by a wild animal). Notably, all these options are limited to what’s available in your immediate physical environment. Several days later, you decide to take another trip through time back to the time of the Renaissance in the Italy. Now, as you wake up in your bed, you can do much the same things you did on the previous trip—think, eat, look around—but now, you also have additional options. Thanks to developments in media technology, you can now pick up and read a book, transporting yourself in a vivid virtual world that is not constrained by your immediate physical environment. After all this time traveling, you wake up in your own bed in the present time. And you notice that you now have an unlimited number of virtual worlds that you can engage with. You can check your work email or social media feeds on your phone, you can video-call your partner to tell him or her about your time-travel adventures, or you can travel to virtual worlds—past, present, and future—with a few movements of your finger on the TV remote. The focus of this chapter is to explore when, how, and why this vast array of virtual worlds can enhance versus compromise psychological well-being. Media technology. In this chapter, we will explore psychological well-being in the context of modern media technology. In common parlance, we often think of the word ‘media’ as referring to mass media, such as news media (e.g., TV, radio), and more recently, to social media (e.g., Facebook, Twitter, Instagram). But media—the plural of medium—broadly refers to any technological tool that serves as a bridge or conduit to stimuli not otherwise available in the immediate physical environment. Thus, media technology refers to books and newspapers, radio and television, video and computer games—or to any device or method people use to transcend the constraints of their immediate physical environment: from yesterday’s dial-up telephone to the today’s smartphone, and from writing a hand-written letter to texting a friend (c.f., Okdie et al., 2014). Related terms also exist in the literature including information and communication technology, or ICT, as well as computer-mediated communication, or CMC. Most of the findings discussed here apply to—and in fact come from—the literature on ICT and CMC. While using the broad term, media technology, this chapter will focus primarily on the effects of media technology developed in the past century or so, including television, video games, and, most recently, mobile computers such as smartphones. In other words, we will be focusing on screen media technology. I will use the term mediated to refer to the stimuli afforded by the media technology, and the term unmediated to refer to behavior that does not involve the use of media (e.g., face-to-face interactions). Even though media technology itself is physical, I will use the term immediate physical environment to refer to the environment in which the media technology use occurs. Well-being. We will explore the effects of media technology on well-being, broadly defined. Because subjective well-being has been defined as a combination of life satisfaction positive affect, and (low) negative affect (e.g., Diener, 1984, 2000; Diener et al., 2017), I will use the term psychological well-being to include not only subjective well-being, but also the factors inextricably linked to subjective well-being such as basic human needs (Baumeister & Leary, 1995; Fiske, 2014; Kenrick, Griskevicius, Neuberg, & Schaller, 2010; Ryan & Deci, 2000; Ryff, 1989). We will use the term emotional well-being to refer to the affective components of subjective well-being (i.e., positive and negative affect). Chapter overview. There are many excellent comprehensive reviews of research on specific media technologies, such as television, video gaming, and social media (e.g., Howard-Jones, 2011; Wilson, Gosling, & Graham, 2012). Rather than providing a comprehensive review of existing research, therefore, the goal of this chapter is to provide an integrative, and theoretically-focused overview of the relationship between media technology and psychological well-being, broadly defined. Thus, I will focus on findings that illuminate key psychological processes (i.e., mediators) and conditions (i.e., moderators) of the relationship between media technology and psychological well-being. This focused approach allows the identification of gaps in the literature, thereby providing guidelines for key future directions in this fast-evolving area of research. Because no comprehensive reviews exist on the psychological effects of smartphones—the latest media device to become part of people’s lives—I will focus on evidence about smartphones whenever possible, drawing on insights from my own emerging research in that area. First, however, I outline my theoretical approach—the complementarity-interference framework (c.f., Kushlev & Heintzelman, in press)—which I then use throughout this chapter to construct an initial complementarity-interference model of media technology on well-being (see Figure 1). Figure 1. 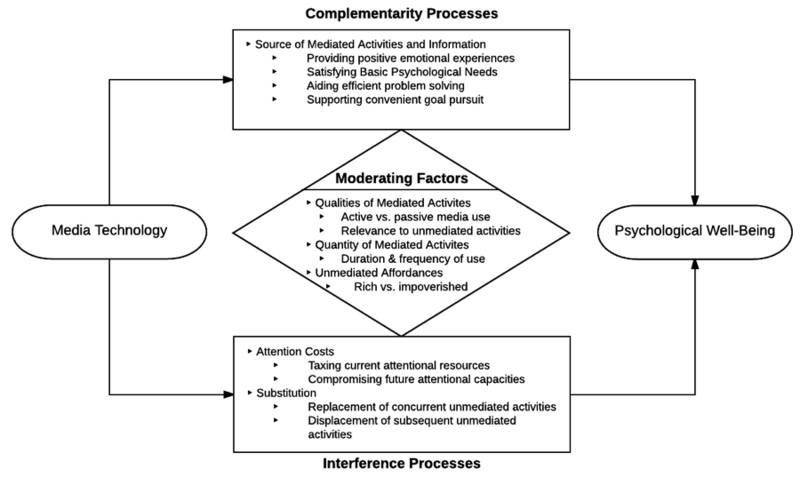 The Complementarity-Interference (CI) Model of the effects of media technology on psychological well-being. Media technology complements the well-being affordances of the unmediated physical environment by providing access to activities and information not otherwise available to users. Media technology can also interfere with the sources of well-being through attention costs and replacement/displacement of unmediated happiness-promoting activities. Moderating factors govern the interplay between these complementarity and interferences processes, including how and how much people use media technology and to what extent the concurrent unmediated physical environment affords engagement in happiness-promoting activities. The focus of this chapter is to explore how and when modern media technology—and the vast array of virtual worlds it provides—impacts well-being. To answer this question, we need to take into account the context in which such technology use occurs. Indeed, media technology use always occurs in the context of the immediate physical environment—and the affordances of that environment for promoting well-being. The critical question, then, is when media technology use complements versus interferes with the sources of well-being available in the immediate environment. Adopting this complementarity-interference framework, I explore evidence for both complementarity and interference processes, and then explore the factors that determine when technology enhances versus undermines psychological well-being. Media technology provides access to a theoretically unlimited number of virtual worlds. In contrast, the activities afforded by the immediate unmediated environment are limited by people’s physical locale. Generally speaking, then, the quantity of the digital affordances for increasing well-being is greater than the quantity of the unmediated affordances. By providing more options for engaging in happiness-supporting activities, media technology has the potential to contribute to higher well-being. Source of positive emotions. Perhaps the clearest empirical demonstration to date of how media technology can complement the unmediated environment comes from a study with patients who were undergoing minor surgery under the waist (Guillory, Hancock, Woodruff, & Keilman, 2015). Each patient was randomly assigned to one of four conditions: (a) a control condition in which patients received standard perioperative management, or three experimental conditions in which patients were asked to engage in one of several activities on their phones during the surgery: (b) text messaging with a companion (e.g., a friend, family member), (c) text messaging with a stranger, or (d) playing an engaging mobile phone game. All participants received an initial dose of analgesic (fentanyl); the researchers then recorded whether patients asked for additional analgesic during the surgery, providing an objective measure of physical pain. Compared to patients undergoing the standard procedure with no technology use, patients who were texting with a friend were approximately 4 times less likely to seek supplemental fentanyl during surgery. Interestingly, patients who were texting with a stranger were almost 7 times less likely to ask for more fentanyl compared to standard treatment. People who played a video game were not significantly less likely to ask for more analgesic compared to those under standard procedure. The findings of Guillory and colleagues (2015) suggest that, above and beyond mere distraction, mediated social interactions can reduce the intensity of negative experiences—even physical pain. But why did texting with strangers have a more pronounced effect than texting with a companion? Linguistic analyses of the text messages showed that while patients who were texting with a friend talked more about the surgery itself, patients who were texting with a stranger were more likely to express positive emotions in their texts. Thus, by affording mediated social interactions that promote the expression of positive emotions, media technology may directly stimulate subjective well-being. Source of basic need satisfaction. Another mechanism by which the additional affordances provided by media technology can enhance well-being is by serving as a source of basic psychological need satisfaction. A mother travelling out of town for work might not be able to cultivate a sense of connectedness with her children in person, but she can exchange text messages, call, or even video call her children. And while a skier visiting Los Angeles may not be able to cultivate a sense of competence by skiing on the streets of LA, she could do so by playing a skiing game on her smartphone (“there is an app for that”). Although skiing mediated through a screen might not be quite the same as skiing at Lake Tahoe, research shows that mediated activities can and do satisfy basic psychological needs. Playing video games, for example, has been shown to effectively satisfy people’s need for competence (e.g., Przybylski, Weinstein, Murayama, Lynch, & Ryan, 2012; Ryan, Rigby, & Przybylski, 2006). Studies have also provided some initial evidence that computer-mediated communication may stimulate teenagers’ sense of social connectedness and subjective well-being (e.g., Desjarlais & Willoughby, 2010; Valkenburg & Peter, 2007). Efficiency and convenience. One of the key benefits—and in fact, a key purpose—of technology is making our lives easier. With the sources of the Internet at our fingertips, we no longer need to go all the way to the library to find popular literature or scholarly work. And with smartphones in our pockets, we can easily find out how to get to even the most obscure of places. Looking for a nearby café to get some work done? No problem, just ask your phone’s personal assistant! Wondering where to find the best Italian restaurant in this neighborhood? The answer is only a tap away through a search engine. Indeed, when people were asked to describe what they like most about their phones, the most commonly used word in their responses was their “convenience” (Smith, 2012). By providing a convenient portal to information, media technology affords instant access to resources not otherwise available in the unmediated environment. With access to a search engine and a GPS map via the Internet, or to one’s family and friends via a quick message, people can more efficiently achieve everyday goals and solve everyday problems. Imagine that your car breaks down on the way to an important meeting. There are no taxis or public transit nearby, and you are going to be late unless you find a solution quickly. Rather than feeling helpless, you can use your phone to call a cab or, perhaps, a friend who lives nearby. To be sure, more than half of US smartphone users report that they have relied on their phones to get help in emergency situations—with 50% having used their phones specifically to deal with car emergencies on the road (Pew Research Center, 2015). Beyond emergency situations, media technology can help people solve more common daily problems, such as finding directions on the go—whether it is to a restaurant for lunch, a gas station on the road, or a café for a necessary cup of coffee. And by making problem solving more efficient, recent research suggests that media technology may support psychological well-being. In one experimental study, for example, all participants were asked to locate a building on a university campus, and were then randomly assigned either to have access or no access to their phones during the search for the building (Kushlev, Proulx, & Dunn, 2017). Participants who relied on their phones found the building faster, and, after finding it, felt happier than those who could not rely on mediated information. By complementing the affordances of the unmediated environment, therefore, media technology can increase emotional well-being. Media technology can sometimes promote well-being by affording access to positive emotional experiences, psychological need satisfaction, and more efficient ways to solve everyday problems. But these same desirable qualities of media technology could also compromise psychological well-being by leading people to disengage from the affordances of the unmediated environment shown to promote well-being. Put simply, engagement with a mediated environment often entails disengagement from the unmediated environment—and the benefits it affords (e.g., Przybylski & Weinstein, 2013). Yet, the unmediated environment is inextricably linked with human flourishing and well-being (e.g., Cacioppo et al., 2006; Lyubomirsky & Boehm, 2010; Myers & Diener, 1995; Nelson, Kushlev, & Lyubomirsky, 2014; Reis, Sheldon, Gable, Roscoe, & Ryan, 2000). I next explore several key mechanisms of interference. Concurrent attention costs. People have limited cognitive capacities (Navon & Gopher, 1979), and performing multiple tasks at once can lead to limiting the cognitive resources dedicated to each task. When two tasks require the same cognitive resource, such as attention or working memory, people cannot perform these tasks simultaneously and must instead switch between tasks (Garavan, 1998; Liefooghe, Barrouillet, Vandierendonck, & Camos, 2008; Oberauer, 2003; Pashler, 1998). The very act of switching between tasks also requires deployment of attention and working memory, further taxing people’s limited cognitive resources (Liefooghe et al., 2008). Thus, the multitasking afforded by media technology likely reduces attention, working memory, and other cognitive resources people can dedicate to the unmediated environment. At the same time, research shows that distraction is one of the strongest predictors of lower positive affect during positive events—more so than psychological tendencies, such as finding faults with events and even directly suppressing positive emotions (Quoidbach, Berry, Hansenne, & Mikolajczak, 2010). Although the human cognitive limitations described above apply to any media technology—from books and newspapers to TV’s and social media—it is smartphones that have truly extended the realm of technological distraction beyond our homes and into virtually everything else people do. It is hardly surprising, then, that about half of Americans admit that their phones have made it harder to give others their undivided attention (Smith, 2012). Indeed, research confirms that mobile phone use can dramatically reduce people’s ability to pay attention to their immediate environment (e.g., Drews, Yazdani, Godfrey, Cooper, & Strayer, 2010; Strayer & Drews, 2007). In a particularly notable study, for example, people who were talking on a cell phone while walking were less likely to see a street entertainer—a unicycling clown—than people not using electronics (Hyman, Boss, Wise, McKenzie, & Caggiano, 2009). To date, little direct evidence exists on how the documented attention costs of media technology might be impacting psychological well-being. In one of the few existing studies to test the role of attention costs, participants were assigned to spend one week maximizing phone interruptions by keeping notification alerts on and their phones within their reach/sight. During another week, the same participants were assigned to minimize phone interruptions by keeping alerts off and their phones away from easy reach as much as possible. Participants reported higher levels of inattention when alerts were on than when alerts were off. Higher levels of inattention in turn predicted lower psychological well-being (Kushlev, Proulx, & Dunn, 2016). Delayed attention costs. In addition to compromising attention during other activities, media technology may be changing people’s ability to pay and sustain attention at a later time. Children’s television viewing habits, for example, have been linked to subsequent attentional problems (e.g., Christakis, Zimmerman, DiGiuseppe, & McCarty, 2004; Johnson, Cohen, Kasen, & Brook, 2007). And playing video games might be an even bigger culprit in causing downstream attentional problems in children. In a US longitudinal study of 6 to 12-year-old children, researchers assessed television viewing and game playing as reported by both the children and their parents (Swing, Gentile, Anderson, & Walsh, 2010). To assess attentional problems, the researchers obtained school teachers’ reports of difficulties with paying and maintaining attention, as well as of children’s tendency to interrupt others in class. After controlling for existing attentional problems in this longitudinal study, the researchers found that television viewing and playing video games both predicted more attentional problems, but that video games were a stronger predictor. Media technology use has also been linked to negative academic outcomes in university students with downstream consequences for subjective well-being. In one study, students who used their mobile phone more had lower GPAs, while also experiencing greater anxiety (Lepp, Barkley, & Karpinski, 2014, 2015)—even after controlling for high-school GPA, as well as demographics, addictive behavior, and relevant personality traits. Though phone use was not directly related to life satisfaction, path analyses indicated that phone use is indirectly related to lower satisfaction with life through lower academic performance and higher anxiety directly associated with phone use. Of course, these correlational findings cannot establish causality, underscoring the need for future research using, for example, longitudinal methodology. One way in which media screen time might be resulting in such downstream attentional and performance issues might be through the effect of screen time on sleep. The light emitted from a screen has been shown to interfere with circadian rhythms and quality of sleep. Researchers have found, for example, that looking at a screen before bed reduces melatonin—a neurotransmitter critical for regulating circadian rhythms (Higuchi, Motohashi, Liu, Ahara, & Kaneko, 2003). Another possible, yet unexplored, mechanism could be found in a more basic characteristic of media: Media experiences are not limited by the same parameters that constrain experiences in the unmediated, physical environment. A scrawny kid might not excel in the school gym, but he can easily become an incredibly strong and agile fighter in the game Street Fighter or become a superhero in the elaborate universe of the World of Warcraft—a massively multiplayer online role-playing game, or MMORPG. But after the rush of playing such video games, this same kid might find it hard to focus on the much less exciting content of his biology textbook. Clearly, future research is needed to explore these and other possible mechanisms through which media technology consumers develop attentional problems. In addition, future experimental and longitudinal research needs to explore the multiple pathways through which such attentional costs might impact well-being—from directly interfering with engagement in activities associated with greater emotional well-being (e.g., face-to-face social interactions) to having downstream consequences for life satisfaction in the long-term by compromising learning, performance, and achievement. Substitution. Media technology can tax attention, thus reducing engagement with potential sources of well-being concurrently available in the unmediated environment. But media technology can also completely replace or obviate engagement with the unmediated environment. Thus, people may incur indirect emotional costs of using media technology by foregoing the benefits of happiness-supporting activities available in the unmediated environment. Playing with other children at the playground can be replaced by playing with other gamers while sitting in front of a computer (e.g., Attewell, Suazo-Garcia, & Battle, 2003). Getting a full night’s sleep can be replaced by a late television show (Higuchi et al., 2003; Oka, Suzuki, & Inoue, 2008). And getting directions from a friendly local has all but been forgotten since smartphones made it so convenient to get directions on our phones (Kushlev et al., 2017). Replacing unmediated social activities. Of all the activities that using media technology could replace, the replacement of unmediated social behavior (e.g., social events, face-to-face social interactions) is perhaps the most relevant to well-being. Interestingly, research suggests that media technology is particularly likely to replace interactions with weak social ties (e.g., acquaintances, strangers) rather than interactions with strong social ties (e.g., friends, family). Putnam, for example, famously showed that participation in community bowling leagues decreased as television sets became a staple in Americans’ homes in the second half of the 20th century (Putnam, 1995). Importantly, he showed that this effect was specific to participating in bowling leagues, rather than to bowling activity in general. Thus, even as TV watching became more popular, people continued to play bowling with their families and friends, but not with members of the broader community. Putnam thus argued that television might be replacing community involvement, with negative consequences for social capital such as eroding sense of community and trust. Consistent with Putnam’s theorizing, recent research shows that portable media technology could also be eroding trust. Specifically, in an American sample from the World Values Survey, people who used their mobile phones more to obtain information were less likely to trust strangers and neighbors (Kushlev & Proulx, 2016). Due to the advent of mobile computing, people can now take their media-producing screens anywhere they go, thus potentially replacing, and even obviating a much broader array of social behaviors than more stationary media technology, such as TV or computers. Why interact with our classmates or colleagues before class or meeting when we can catch up on our social media feed? And why try to spark a conversation with a stranger on public transit, when we can safely entertain ourselves on our phones? Yet, social interactions—even those with mere strangers—are an important source of social and emotional well-being. In one study, for example, coffee shop customers were randomly assigned to either have a friendly interaction with the barista while getting their coffee or to have an efficient interaction by minimizing conversation. The friendly customers subsequently felt a greater sense of belonging than the efficient customers. In other words, having a friendly interaction with a stranger helped people to satisfy their basic need for relatedness (Sandstrom & Dunn, 2014). Emerging evidence suggests that screen time spent on new media might indeed be replacing in-person social interactions, with consequences for psychological well-being. In one experience sampling study, researchers tracked how people felt several times a day for two weeks. They found that the more people used Facebook earlier in the day, the less happy they felt later in the day, even when controlling for earlier affect (Kross et al., 2013). Furthermore, the more people used Facebook, the less they interacted with others in person. Importantly, controlling for the frequency of in-person interactions—which predicted higher well-being—attenuated the negative relationship between Facebook use and emotional well-being. These findings suggest that Facebook use might be linked to lower well-being (for a review, see Wilson et al., 2012) at least in part because social media use replaces face-to-face social interactions. In addition to providing alternative social activities such as Facebook, smartphones are an incredibly powerful source of information. While undoubtedly convenient, this ease of information access can obviate the need to rely on fellow humans for information, leading people to forgo opportunities to cultivate a sense of community, social connectedness, and trust. In an experimental study I described earlier, people were asked to locate a building, and then randomly assigned either to rely or not to rely on their phones. Participants relying on their phones talked to fewer people to obtain directions and ended up feeling less socially connected than participants who relied on the kindness of others (Kushlev et al., 2017). These findings suggest that portable media technology can reduce sense of community, connectedness, and trust by replacing unmediated, face-to-face social interactions—a key source of social capital. Displacing sleep time. In addition to replacing activities that satisfy basic psychological needs, media technology might be displacing activities that satisfy basic physiological needs. In a 10-day experience sampling study of working adults, researchers measured late-night technology use (i.e., after 9 pm), including watching TV, and using a computer, a tablet, and a smartphone specifically for work (Lanaj, Johnson, & Barnes, 2014). The researchers found that each type of technology use had independent, within-subjects effects on sleep quantity—even when controlling for the previous night’s sleep quantity and quality. Put simply, people slept less on evenings when they used media technology more. Notably, even though people spent ten times fewer minutes using their smartphones than watching TV—4 min versus 40 min—smartphone use explained twice as much of the variance in sleep quantity (4% vs. 2%). Exploring the link between phone use and sleep further, Lanaj and colleagues (2014) found that by displacing sleep, phones had downstream consequences for how psychologically depleted people felt in the morning: To the extent that phones interfered with sleep, people felt more drained and unable to concentrate in the morning. Morning depletion in turn predicted lower work engagement (e.g., feeling completely absorbed in a work task) as measured by the Utrecht Work Engagement Scale. Though Lanaj and her colleagues did not measure well-being, robust evidence exists that work engagement is associated with psychological need satisfaction (e.g., competence, autonomy) and, consequently, with subjective well-being (e.g., Deci et al., 2001; Harter, Schmidt, & Hayes, 2002). Future research is needed to clearly establish the relationship between media use and well-being as mediated by sleep, depletion, and work engagement. I have so far considered some key mechanisms through which media technology might complement or interfere with people’s “default” source of psychological well-being: the unmediated physical environment. But, of course, the more interesting theoretical question is under what conditions the benefits of media technology outweigh its costs—and vice versa. Unfortunately, there is little research directly exploring these moderating variables. Yet, given that the literature abounds with both positive and negative findings about the effects of media technology on well-being, understanding the critical moderators between complementarity and interference processes is perhaps the most important avenue for future theoretical and empirical work. Accordingly, using the proposed CI framework, I next explore some of the key possible moderators. At the broadest level, the net effects of media technology on well-being in any given period should depend on: (1) the nature of the media activities, that is what media technology people are using and how they are using it; (2) the quantity of media activities, that is how much people are using media technology; and (3) the well-being affordances within the unmediated environment, that is what opportunity costs people are incurring when using media technology. Quality: Active versus passive use. Research has suggested that complementarity processes of media technology use are potentiated when people use media actively rather than passively. Direct evidence for the role of active versus passive use as a moderating factor comes from research on social media. Compared to people who use Facebook passively by browsing through others’ content, people who use Facebook actively by sharing content with others experience greater social capital and feel less lonely (Burke, Marlow, & Lento, 2010). Active media use thus seems to be a more effective way of satisfying basic psychological needs than passive use. Quality: Relevance to the unmediated environment. I identified attention costs as one of the key mechanisms through which media behavior interferes with the benefits of unmediated activities. But people frequently use media technology in ways that directly support their unmediated activities. In a representative poll, for example, seven in ten Americans reported having used their phones for purposes directly related to their face-to-face social interactions (Rainie & Zickuhr, 2015). In situations in which people use media technology to directly support their unmediated activities, the interference process through attentional costs should not apply. Thus, for example, looking at one’s phone to find pictures or a video to share with one’s dinner companions may result in net benefits to emotional well-being, whereas checking work email might produce net loss for emotional well-being. And while staying at home alone on Sunday to binge watch movies online on Netflix might lead people to forgo the benefits of socializing with friends or family, gathering with friends to socialize and eat Nachos while watching the Super Bowl might lead to greater benefits to well-being than would socializing (and eating Nachos) alone, that is without the stimulating effect of the spectacle. Only initial evidence exists to show that relevance of media use to concurrent unmediated activities can determine well-being outcomes. In the only such study to-date, parents spending time with their children at a museum were randomly assigned to use their phones a lot or to limit their phone use. Overall, parents assigned to use their phones frequently—compared to those assigned to limit phone use—felt less socially connected while spending time with their children. This overall negative effect on social connectedness was mediated by the negative effect of phone use on attention. Further, the effect of phone use on social connectedness held regardless of whether parents used their phones for social purposes (e.g., text messaging, social media) or work purposes (e.g., email). Thus, any type of phone use that was not directly relevant to parents’ experiences with their children at the museum predicted lower social need satisfaction. Notably, however, parents who used their phones specifically to obtain relevant information about the exhibits (e.g., by using the museum’s app for information about the exhibits) felt a greater sense of connection (Kushlev, 2015). In other words, relevant phone use predicted higher social need satisfaction. While illuminating, this evidence is correlational and exploratory, underscoring the need for future experimental work to directly manipulate the relevance of media technology use to the unmediated environment. Quantity. In addition to how people use media technology, the effects of media technology on well-being should depend on how much people use this technology in any given period of time. Of course, the excessive use of the media technology should be particularly likely to interfere with other behaviors that can satisfy psychological needs. While even 4 minutes of phone use for work before bed predicts less time sleeping at night (Lanaj et al., 2014), excessive phone use has been linked to complete inability to sleep (Tavolacci, Meyrignac, Richard, Dechelotte, & Ladner, 2015). More broadly, spending excessive time online has been linked to dramatic outcomes, such as job loss, marriage breakdown, and academic failure (Whang, Lee, & Chang, 2003). In some cases, the consequences can even be fatal—literally. An 18-year-old Taiwanese teenager died after a 40-hour marathon of playing an online video game. A Korean couple spent so much time raising their virtual daughter in an online game that they neglected their own biological daughter; the daughter (the real one) eventually died (Wallace, 2014). And a British man who regularly played for 12 hours at a time developed a blood clot and died from pulmonary aneurism; he was only 20 years old at the time. On the opposite side of the spectrum, however, some media technology use should theoretically be beneficial to well-being (see Figure 1). Even though excessive video gaming can be detrimental to well-being—and even deadly—some video game playing can also satisfy basic psychological needs (Przybylski et al., 2012; Ryan et al., 2006). This suggests that the relationship between media technology use and psychological well-being may be characterized by a reverse U-shaped function. Curvilinearity. Researchers have discovered that time spent watching television is curvilinearly related to life satisfaction: Some TV watching predicts greater life satisfaction than both excessive TV watching or no TV watching at all (e.g., Jegen & Frey, 2004). In the domain of video games, a study with 444 Iranian adolescents found that those who spent some time playing video games had better mental health than both non-gamers and excessive gamers (i.e., those who played more than 10 hours a week; Allahverdipour, Bazargan, Farhadinasab, & Moeini, 2010). Similarly, in the realm of social media, studies have suggested that the number of Facebook friends has an inverse U-shaped relationship with subjective well-being (e.g., Kim & Lee, 2011). And even though multiple studies have found a negative relationship between Facebook use and subjective well-being (Wilson et al., 2012), recent research has suggested that Facebook users are happier and more satisfied with their lives than Facebook nonusers (Brailovskaia, & Margraf, 2016). Despite this consistent evidence for curvilinearity, future research is needed to provide more nuanced understanding of the curvilinear relationship between media technology use and psychological well-being. In the domain of social media, for example, research could explore whether the documented curvilinear relationship between Facebook use and well-being is driven primarily by passive users, or whether active Facebook users can also get too much. In the context of video games, research is needed to illuminate whether some video games are characterized by stronger curvilinear relationships with well-being than others, as well as whether people are more likely to play some video games more excessively than others. It is possible, for example, that video games with a strong social component—such as MMORPGs, where players can play in online guilds, teaming up with other players in virtual quests—might be particularly beneficial for well-being by satisfying social needs. But such games might also be more likely to result in excessive use, thus compromising well-being. Research is yet to explore curvilinearity in the relationship between smartphone use and well-being. In examining curvilinearity in the case of smartphones, researchers might be well advised to focus on frequency of use and number of notifications in addition to the total time spent on phones. In one study, for example, phone notifications alone significantly disrupted performance on an attention-demanding task, even though participants did not directly interact with a mobile device during the task (Stothart, Mitchum, & Yehnert, 2015). The magnitude of observed effects on attention was comparable in magnitude to those seen when users actively used a mobile phone (e.g., calling, texting). In other words, even though people spent no time using their phones, they still incurred attention costs simply as a result of receiving notifications. Affordances of the unmediated environment. According to the CI model, key factors that should determine whether media technology would have a net positive or a net negative effect on psychological well-being should be the quantity and the quality of happiness-promoting activities afforded by the unmediated environment. Indeed, evidence suggests that even though media technology use has opportunity costs for well-being in the context of environments rich in actual and potential social partners (e.g., Przybylski & Weinstein, 2013), media technology can be beneficial to well-being in more impoverished social environments, such as when undergoing minor surgery (Guillory et al., 2015). And, as we saw earlier, smartphone use has been shown to reduce parental well-being during a time when parents were spending time with their children at a science museum (Kushlev, 2015). But would phone use have enhanced parental well-being if the study were run not in the stimulating environment of a museum, but rather in an impoverished environment such as while waiting to pick up one’s child from school? To date, no research has explored the affordances of the unmediated environment as a moderating factor in the well-being effects of media use, highlighting a fruitful area for future research. Political, economic, and societal factors. In addition to the affordances of the immediate unmediated environment, the broader context of one’s political, economic, and societal milieu is likely both important and understudied moderating factors of media use. I have so far examined a range of psychological mechanisms in depth, largely ignoring the effects of media technology on broader political, economic, and societal factors that also have implications for well-being. Thus, for example, social media and mobile Internet access have allowed an unprecedented ability of groups of people—particularly those in developing or undemocratic countries—to quickly and easily organize and congregate to achieve desired political and social changes. Indeed, three quarters of the people surveyed in India, China, Indonesia, and South Africa agreed that wireless mobile technology has given citizens a greater voice in their country; in the U.S. and the U.K., less than half think so (Qualcomm, 2013). And during the Arab Spring, for example, social media was credited as a critical factor in the successful overthrowing of current regimes in countries like Egypt and Tunisia (Howard et al., 2011). Presumably, the use of media in such critical historical and political contexts fosters social interaction, builds social capital, and could produce happiness boosts that dwarf any costs. In addition to allowing the organizing of grassroots movements for political change, access to media technology can produce economic benefits for users, particularly in poor and developing countries. For example, small scale framers—who produce up to 80% of the food in developing countries—often sell their produce for much less than market value because they cannot afford to travel by themselves to the city markets. But a mobile phone platform is allowing small-scale farmers in Kenya to easily communicate with each other, organize transportation to the city markets, and thus sell their produce to consumers for up to four times as much profit as before (Al Jazeera, 2014). This economic benefit of technology goes beyond small-scale farming: About three quarters of people in India, China, Indonesia, and South Africa, for example, agree that wireless mobile technology has been instrumental in finding the highest price for something they want to sell (Qualcomm, 2013). Finally, the broader societal benefits of having easy access to the Internet through mobile media technology cannot be overstated. Across the developed world, smartphones are being used to provide real-time sharing of information between physicians and patients, thus helping to improve healthcare (World Health Organization, 2011). Like the positive political and economic effects of mobile media technology, however, these effects are more pronounced in developing countries. For example, 9 out of 10 people in China and Indonesia think that mobile technology has made it easier for them to access information to maintain their own and their family’s health; in the U.S., only about half think so (Qualcomm, 2013). In short, the use of media technology in Western, educated, industrialized, rich, and developed—or WEIRD (Henrich, Heine, & Norenzayan, 2010)—countries might have very different effects on well-being from the effects this same technology has in the rest of the world. Just as with most other topics in psychological science, however, research outside WEIRD countries is badly needed. Theoretical issues. Throughout this chapter, I have been highlighting gaps in the literature, charting important directions for future research. Specifically, guided by CI framework, I have highlighted the lack of evidence for some of the critical mediating and moderating factors in the relationship between media technology and psychological well-being. Mediating factors that need further evidence include, for example, the long-term effects of media technology’s attention costs on well-being. Moderating factors that need further research include the relevance of media technology use for unmediated activities, the quality and quantity of the well-being affordances of the unmediated environment, the role of how much and how frequently people are using media technology, and the broader economic and political conditions. While highlighting these critical areas for future research, it is worth noting that all processes and conditions outlined here can benefit from replication and additional evidence. Indeed, my broader goal in integrating existing evidence in an initial theoretical model has been to stimulate more theoretically-driven future research that could shed light on the critical factors at play. It is worth noting, however, that I view the CI model proposed here only as a blueprint to be improved and refined in the future. Thus, for example, future empirical and theoretical work can reveal other mediating and moderating factors to be added to the model. Future theorizing and research could also increase the complexity of the model by considering how the various processes and conditions interact with each other. Thus, for example, researchers can consider additive and subtractive effects of the various mediating processes, or explore how some of the moderating conditions might interact with one another. My hope is that by sowing the seeds of a theoretical model, researchers working across disciplines will be able join forces to understand the key factors in the relationship between media technology and well-being. Thus, when new media technologies become an integral part of people’s lives in the future—as print media, television, gaming, and mobile computing have done in the past—researchers will be able to launch a focused, theoretically-grounded research program to understand how these new media technologies are similar to—and how they are different from—existing technologies. Methodological issues. At the methodological level, this review has revealed that even after many decades of research, causal evidence for key factors and outcomes is often lacking. This is no doubt in part due to the challenges of exploring causality when studying the effects of human behavior as it occurs naturally “in the wild”. One such challenge is manipulating natural behavior by asking people to use their media technology differently. Such field manipulations can be both practically and ethically problematic. Because media use plays such an integral part in people’s daily lives, it could be practically difficult to recruit samples willing to substantially reduce their media use, and even more difficult to make people follow such experimental instructions. On the flip side, asking people to increase their media technology use could be ethically problematic given the existing research on the detrimental—and in some cases fatal—effects of excessive use. Such legitimate ethical issues can be minimized by reducing the duration of the study—thus minimizing any lasting effects on well-being or health—and by carefully choosing experimental situations in which increased use of media technology is unlikely to produce any serious harm. For example, while it might be ethically and practically unproblematic to study parents as they spend an afternoon with their children in the safe, enclosed environment of a science museum, asking parents to maximize their phone use for an entire week can be ethically problematic (e.g., because it can reduce necessary supervision of children in more hectic and potentially dangerous environments, such as a busy street intersection). When experimental work is impractical or unethical, researchers should employ alternative methodologies that can give suggestive causal evidence. Some of the research reviewed in this chapter illustrated the benefits of longitudinal research (e.g., Swing et al., 2010) and experience sampling, or ESM (e.g., Lanaj et al., 2014). These methods can isolate causality by allowing controls for previous media behavior and well-being, while also allowing disambiguation of within and between-subject effects, thus controlling for any individual differences. Of course, only multi-method research program can provide clear evidence for the key factors at play. In 1889, the British Medical Journal warned readers of “aural overpressure”—a new malady due to “almost constant strain of the auditory apparatus” in people who used telephones for long periods of time. Symptoms of the condition apparently included nervousness, buzzing in the ears, giddiness, and neuralgic pains (Marvin, 1988). More than a century later, and with a lot more phones around us, we seem to be all but free of this supposed malady. This example highlights the fact that new technologies have always generated concerns about the effect they may have on people’s subjective well-being (e.g., Turkle, 2011). Far from endorsing unbridled concerns about the perils of media technology on well-being, I have begun to identify the processes and conditions (Figure 1) that determine how and when media technology use could boost or hurt psychological well-being. It is my hope the theoretical model proposed here would stir further theory development and necessary empirical research in order to understand the costs and benefits of the media technology of today and of the future. Burke, M., Marlow, C., & Lento, T. (2010). Social network activity and social well-being. Postgraduate Medical Journal, 85, 455–459. Deci, E. L., Ryan, R. M., Gagne, M., Leone, D., Usunov, J., & Kornazheva, B. P. (2001). Need satisfaction, motivation, and well-being in the work organizations of a former Eastern Bloc country. Personality and Social Psychology Bulletin, 27, 930–942. Howard-Jones, P. (2011). The impact of digital technologies on human wellbeing: Evidence from the sciences of mind and brain. Oxford, England: Nominet Trust. Jegen, R., & Frey, B. S. (2004). TV-konsum und rationalität. In: Gabriele Siegert and Frank Losig (Eds) Zwischen marktversagen und medienvielfalt. medienmärkte im fokus neuer medienökonomischer anwendungen (pp. 150–166). Baden-Baden, Germany: Nomos. Kushlev, K. (2015). Digitally connected, socially disconnected: Can smartphones compromise the benefits of interacting with others? Unpublished doctoral Dissertation. University of British Columbia. Kushlev, K., & Heintzelman, S. J. (in press). Put the phone down: Testing a complement–interfere model of computer-mediated communication in the context of face-to-face interactions. Social Psychological and Personality Science. Marvin, C. (1988). When old technologies were new: Thinking about electric communication in the late nineteenth century. New York, NY: Oxford University Press. Pashler, H. (1998). The psychology of attention. Cambridge, MA: MIT Press. Swing, E. L., Gentile, D. A., Anderson, C. A., & Walsh, D. A. (2010). Television and video game exposure and the development of attention problems. Pediatrics, 126, 214–221, doi:10.1542/peds.2009–1508. Turkle, S. (2011) Alone together: Why we expect more from technology and less from each other. Old Saybrook, CN: Tantor Media. Whang, L. S., Lee, S., & Chang, G. (2003). Internet over-users' psychological profiles: A behavior sampling analysis on Internet addiction. CyberPsychology & Behavior, 6, 143–152. doi:10.1089/109493103321640338.